The icon shows 47 Tucanae (NGC 104). Globular clusters are gravitationally bound concentrations of approximately ten thousand to one million stars, spread over a volume of several tens to about 200 light years in diameter. The first globular cluster discovered, but then taken for a nebula, was M22 in Sagittarius, which was probably discovered by Abraham Ihle in 1665. This discovery was followed by that of southern Omega Centauri (NGC 5139) by Edmond Halley on his 1677 journey to St. Helena. This "nebula" had been known but classified as star since ancient times. Next followed the discovery of M5 in Serpens Caput by Gottfried Kirch in 1702, and that of M13 in Hercules, again by Halley, in 1714. De Chéseaux's list of (21) nebulae of 1746 contains, in addition, two new globular clusters, M71 and M4, while Jean-Dominique Maraldi discovered M15 and M2 in September of this year (1746). Guillaume Legentil possibly or probably discovered NGC 6712 in 1749. Nicholas Louis de Lacaille's catalog of (42) southern "nebula" of 1751-52 contains 7 globular clusters (among them 4 new ones), while Messier's catalog of 110 objects contains a total of 29 globulars, 20 of them new discoveries. Charles Messier was the first to resolve one globular cluster, M4, but still referred to the other 28 of these objects in his catalog as "round nebulae." Thus, in summer 1782, before William Herschel started his comprehensive deep sky survey with large telescopes, there were 34 globular clusters known. Herschel himself discovered 36 new globulars, bringing the number of known globulars to 70. He was the first to resolve virtually all of them into stars, and coined the term "globular cluster" in the discussion adjacent to his second catalog of 1000 deepsky objects (1789). These early known globulars are all belonging to our Milky Way Galaxy, but some of them have been integrated, or have immigrated into the Galactic Globular Cluster system only recently, including M54 (noted 1994) and M79 (noted 2003). Melotte's list of 1915 already lists 83 globulars, Shapley (1930) has 93, one of them in the Large Magellanic Cloud (NGC 1651). Helen Sawyer (Hogg, 1947) lists 99 Milky Way globular clusters, 97 of which are still considered as such; her 1959 list (Sawyer Hogg 1959) has 118 entries (115 real). Further lists of Arp (1965), Alcaino (1973) and Kukarkin (1974) have between 119 and 131 clusters. Becvar lists 100, the Sky Catalogue 2000.0 lists 138 globulars, a number given for 1987 also by Kenneth Glyn Jones (1991). The more recent compilations of Webbink (1985) and Djorgovski and Meylan (1993) have 154 and 143 (both 141 real), respectively. W.E. Harris' database of 1994 contains 142 (the same 141 real objects), that of 1996 and 1997 have 146, the 1999 version has 147, the version of February 2003 contains 150, and the most current revision (December 2010) version contains 157, with 8 more candidates not sufficiently confirmed yet. Of the 157 known globular clusters of our Milky Way galaxy, 104 are in the NGC catalog, and 3 more in the IC catalog of J.L.E. Dreyer. Since their discovery and resolution, globular clusters were always thought or suspected to be physical objects, agglomerations or swarms of stars held together by their mutual gravity, all close together and at about the same distance. The proof for this correct guess, or working model, came only with spectroscopy, showing that the stars of these clusters have radial velocities as expected for such swarms, and perfectly match in color-magnitude or Hertzsprung-Russell diagram, i.e. they represent a population of stars of about same age (also see below), all at about the same distance. The distribution of the globular clusters in our Milky Way galaxy is concentrated around the galactic center in the Sagittarius -- Scorpius -- Ophiuchus region: Of the 138 Milky Way globulars listed in the Sky Catalog 2000, these constellations contain 29, 18, and 24 globulars, respectively, so a total of 71 clusters, or 51.4 percent (though one must admit that of the 29 clusters listed in Sagittarius, probably four are members of the Sagittarius Dwarf Elliptical Galaxy discovered 1994, and not really of the Milky Way, among them M54; however, these are in process to be integrated into the Milky Way's halo). Current counting (July 2011) brings these numbers to 35, 23 and 33 globulars in Sagittarius, Scorpius and Ophiuchus, respectively, thus a total of 91 clusters of a total of 151, or 57.9 percent. Of the 88 constellations, only 46 or little more than half contain any globular cluster at all; Ara and Serpens follow with 5 each, Hercules and Aquila with 4 clusters each, and no further constellation contains more than 3. Of the 157 known clusters, 141 (89.8 percent) are concentrated in the hemisphere centered on Sagittarius, while only 16 globulars (10.2 percent) are on the opposite side of us (among them M79). Of these 16, four (including M79) are suspected to be members of the remnant globular cluster system of the Canis Major Dwarf galaxy discovered in 2003, which again is going to be integrated into the Milky Way's Galactic Halo. This pronounced anisotropy in the distribution of globular clusters was of historic importance when Harlow Shapley, in 1917, derived from it that the center of our galaxy is lying at a considerable distance in the direction of Sagittarius and not close to our solar system as had been thought previously (however, he significantly overestimated the size of the Milky Way as a whole, as well as the size of the globular cluster system and our distance from the Galactic Center). 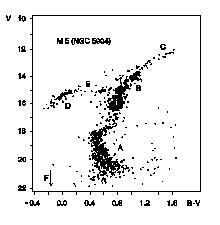 Woltjer (1975) investigated the distribution of the globular clusters of out Milky Way and classified them as halo globulars or disk-like globulars. Radial velocity measurements have revealed that most globulars are moving in highly excentric elliptical orbits that take them far outside the Milky Way; they form a halo of roughly spherical shape which is highly concentrated to the Galactic Center, but reaches out to a distance of several 100,000 light years, much more than the dimension of the Galaxy's disk. As they don't participate in the Galaxy's disk rotation, they can have high relative velocities of several 100 km/sec with respect to our solar system; this is what shows up in the radial velocity measurements. Ninkovic (1983) has estimated excentricities of globular cluster orbits. To determine the physical orbits of globular clusters, it is required to know their proper motions in addition to the radial velocities. Cudworth and Hanson (1993) undertook some first rough determinations of proper motions with respect to background galaxies. From these and similar measurements, Van den Bergh (1995) estimated perigalactic distances, and Dauphole et.al. (1996) calculated first approximate orbits. Much more acurate data for proper motions became only available from astrometrical data obtained with ESA's Hipparcos satellite in 1997, from which space motions (Geffert et.al. 1997) and approximate orbits (Brosche et.al. 1997) could be determined. Spectroscopic study of globular clusters shows that they are much lower in heavy element abundance than stars such as the Sun that form in the disks of galaxies. Thus, globular clusters are believed to be very old and consisted from an earlier generation of stars (Population II), which have formed from the more primordial matter present in the young galaxy just after (or even before) its formation. The disk stars, by contrast, have evolved through many cycles of starbirth and supernovae, which enrich the heavy element concentration in star-forming clouds and may also trigger their collapse. Globular clusters typically contain a number of variable stars, in particular RR Lyrae stars which were once called "Cluster Variables" because of their abundance in globulars. Their frequency is varying from cluster to cluster. A small number of four globular clusters also contains planetary nebulae; these appear to be so rare because of the short liftime of planetary nebulae. They also contain a large number of white dwarfs and, at least in some cases, many neutron stars, some of which show up as pulsars. The H-R diagrams for globular clusters (here shown for M5) typically have short main sequences and prominent horizontal branches, this again represents very old stars that have evolved past giant or supergiant phases. Comparison of the measured HRD of each globular cluster with theoretical model HRDs derived from the theory of stellar evolution provides the possibility to derive, or estimate, the age of that particular cluster. It is perhaps a bit surprising that almost all globular clusters seem to be of about the same age; there seems to be a physical reason that they all formed in a short period of time in the history of the universe, and this period was apparently long ago when the galaxies were young. Semi-recent estimates yield an age of 12 to 20 billion years; the best value for observation is perhaps 12 to 16 billion (see e.g. the discussion at M92). As their age is crucial as a lower limit for the age of our universe, it was subject to vivid and continuous discussion since decades. In early 1997, the discussion of the age of the globular clusters got revived because of the general modifications of the distance scale of the universe, implied by results of ESA's astrometrical satellite Hipparcos: These results suggest that galaxies and many galactic objects, including the globular clusters, may be at a 10 per cent larger distance; therefore, the intrinsical brightness of all their stars must be about 20 % higher. Considering the various relations which are important for understanding stellar structure and evolution, they should also be roughly 15 % younger, in a preliminary off-hand estimate. Although significantly slower compared to the less densely packed and less populated open clusters, these disturbations are tending to disrupt the clusters. The currently existing globulars are just the survivors of a perhaps significantly larger population, the rest of which has been disrupted and spread their stars throughout the Galactic halo. The process of destruction still works, and it was estimated that about half of the Milky Way globulars will cease to exist within the next 10 billion years. Our galaxy has a system of perhaps about 180 to 200 globular clusters (including the 29 Messier globulars, of which two may have immigrated only recently: M54 and M79). Most other galaxies have globular cluster systems as well, in some cases (e.g., for M87) containing several thousands of globulars! A small number of the known extragalacric globulars is in the reach of larger amateur telescopes; see Jim Shield's Extragalactic Globulars webpage for examples. While all the globulars in our Milky Way, and our big companion, the Andromeda Galaxy M31, are old, other Local Group galaxies as the Large and the Small Magellanic Cloud as well as the Triangulum Galaxy M33 also contain considerably younger globular star clusters, which can be concluded with certainty from spectroscopic investigations. These galaxies contain also extremely large diffuse nebulae with masses of the order of globular clusters, clear candidates for future young globulars currently in formation, notably the Tarantula Nebula NGC 2070 in the LMC and NGC 604 in M33. A large number of over 100 young globular clusters have been detected recently in M82, an irregular galaxy beyond the Local Group. Messier's globular clusters: M2, M3, M4, M5, M9, M10, M12, M13, M14, M15, M19, M22, M28, M30, M53, M54, M55, M56, M62, M68, M69, M70, M71, M72, M75, M79, M80, M92, M107. Other early known globular clusters: NGC 104 (47 Tucanae), NGC 4833, NGC 5139 (Omega Centauri), NGC 6397, NGC 6712. Dead Link! Globular Cluster Catalog: Info and references, by Leroy W.L. Guatney. Includes a Globular Observing "Club". A galactic globular cluster database, by Marco Castellani. Data (Harris), images (DSS) and color-magnitude diagrams. Halton C. Arp, 1965. Globular Clusters in the Galaxy. Ch. 19 in: Galactic Structure, ed. A. Blaauw, p. 401. Univ. of Chicago Press. Antonin Becvar, 1964. Atlas of the Heavens - II, Catalogue 1950.0. Publishing House of the Czechoslovak Academy of Sciences, Praha and Sky Publishing Corporation, Cambridge, Massachusetts. Fourth enlarged edition. Here: Globular Clusters, p. 289-292. Kenneth Glyn Jones, 1991. Messier's Nebulae and Star Clusters. 2nd revised edition, Cambridge University Press. Alan Hirshfeld and Roger W. Sinnott (eds. ), 1985. Sky Catalogue 2000.0. Volume 2. Double Stars, Variable Stars and Nonstellar Objects. Cambridge University Press and Sky Publishing Corporation, Cambridge, Massachusetts. Here Globular Clusters, pp. 291-294, and introduction pp. xxiii-xxiv.